[132 Pages Report] MarketsandMarkets expects the total Telecom IT Services market to grow from $67.38 billion in 2014 to $233.05 billion in 2019 at a CAGR of 28.2% during the forecast period. Telecom operators can gain competitive advantage by employing IT services to discover their customer behavior patterns and their usage. IT services also enable operators to deliver its services to the end users in an efficient and effective way with the desired quality of service as expected by customer enhancing the customer experience thereby driving the customer loyalty. The Telecom IT services market has the presence of large player like IBM, Ericsson, Oracle, HP, Amdocs offerings services and solutions in this market. The market has seen these players grab high amount of market share. Companies such as IBM, HP have moved towards providing separate solution and services for small and medium business (SMB’s) owing to the high demand for IT services by these industries. This report analyzes global adoption trends, future growth potential, key drivers, restraints, opportunities, and best practices in the Telecom IT services market. The report also examines growth potential, market sizes, and revenue forecasts across different regions as well as industry verticals. Telecom IT services provided by the IT providers to telecom operators enable operators to run their business in a more effective and efficient way. The telecom has seen a rapid rise in competition which has affected the growth and profitability of this vertical. Decrease in average revenue per user has also affected the market in a negative away where the telecom operators are faced with the challenging task of achieving growth in the Telecom IT services market. IT providers are enabling Telecom operators to effectively manage there IT infrastructure in a better and far more efficient way. The major factors driving the Telecom IT Services market are financial pressures faced by the Telecom operators and the competence needs. These factors have led to the growth of IT services in telecom sector. The increasing pressure to operate in profit and to grow in the current market is driving the operators to reach to the IT service providers to optimize the business processes. The last few years have seen the operator portfolio getting complex due to Mergers and acquisitions new service launches which has made the IT requirement in this vertical complex. Telecom do not possess the competency that is required to mange this infrastructure and have moved towards IT providers to manage the IT resources ensuring continuous availability o these resources. Factors such as high capital expenditure required for IT services and changing government norms are some of the factors that are hindering the growth of this market. These factors have led spending in this market to grow at moderate rate which has proved as one of the major barriers for the growth of market. 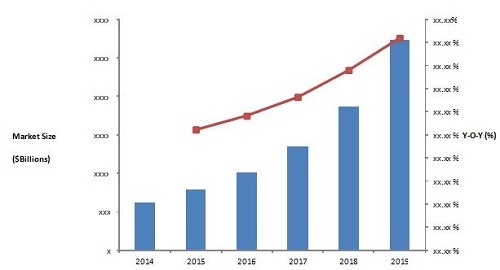 MarketsandMarkets expects the total Telecom IT Services market to grow from $67.38 billion in 2014 to $233.05 billion in 2019 at a CAGR of 28.2% during the forecast period.